This year we had great weather in our part of the world. The vegetables in the garden did very well and provided us with lots of beetroot and other vegetables and fruit. I still have some beetroots left in the ground. The beetroots I have used for this recipe are a multi-coloured variety, but you can use the same recipe for just red beetroots. 500g Beetroot - Washed and scrubbed. Cut the top and tail off the beetroots. Put in a pan, cover with water, bring to boil and simmer on low heat for about 45min - 1 hour. I usually poke the beetroots with a sharp knife after 45 min, keep doing this every 5 minutes until the knife goes through the beets without any resistance. When cooked, set the beetroots aside to cool. Then remove the outer skin. Place on a board and slice as above. 1 tsp each of the following: crushed coriander seeds, ground ginger, ground cumin. Heat the oil in a pan on high heat, mix all the spices and add it to the pan. Stir for 20-30 sec or until the aroma of the spices come through - burns very quickly, so watch over it. The smell is wonderful. Add the cooked and sliced beetroots to the pan of spices. Stir for two minutes on low heat, making sure the beets are well covered with the spices. Add these to the beetroots in the pot. Turn the heat up for 1 minute or until you see the liquid is bubbling. Then turn the heat down very low. Put the lid on and simmer for 15-20 minutes. DO NOT let it dry out. The juice is lovely and you can use it to decorate the dish. (See the main photo). You can also reduce the juice separately if it is too runny. It needs to be a nice consistency for adding a few drops to the dish. Serve this with salmon, fish or meat. My favourite is salmon steak fried on a griddle pan (with plenty of black ground pepper) together with roast potatoes. I'll photograph this in the future and will add it to this post. I love my food spicy. But If you find the spices too much for you, just reduce or eliminate the ones you don't want. 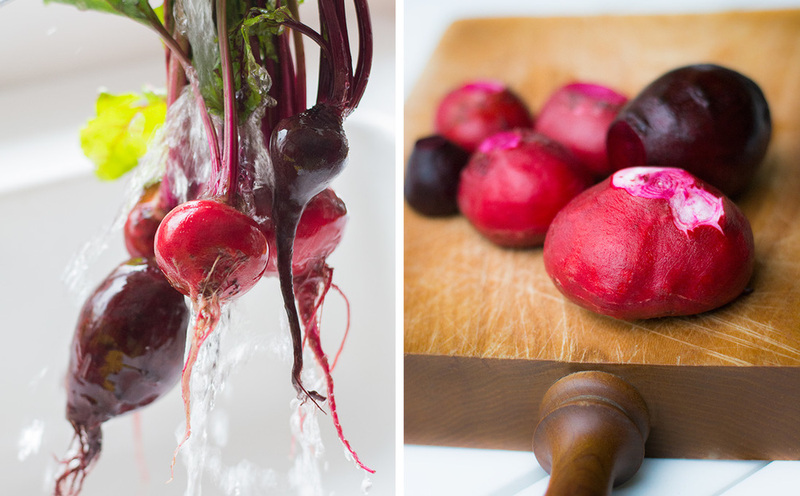 Wash and scrub the beetroots. Cut the top and tail off the beetroots. Put in a pan, cover with water, bring to boil and simmer on low heat for 45min - 1 hour. I usually poke the beetroots with a sharp knife after 45 min, keep doing this every 5 minutes until the knife goes through the beets without any resistance. 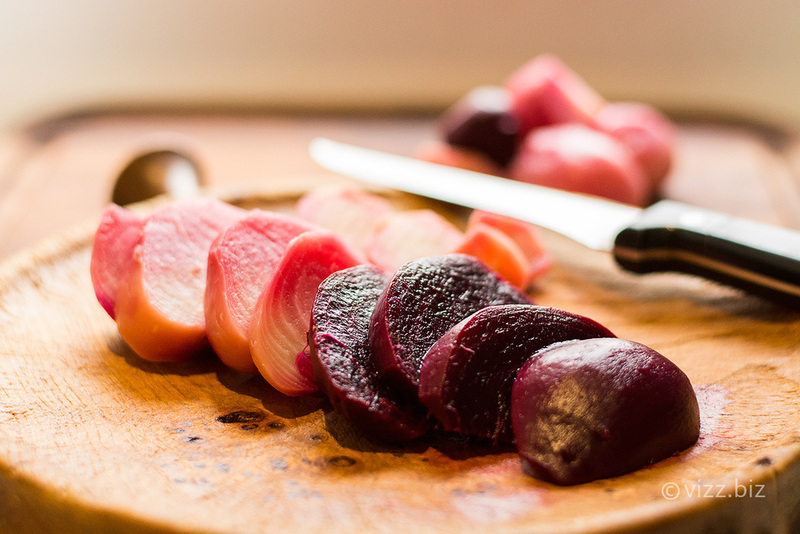 When cooked, set the beetroots aside to cool. Then remove the outer skin and slice. Add the cooked and sliced beetroots to the pan of spices. Stir for two minutes on low heat, making sure the beetroots are well covered with the spices. Add the sugar and the vinegar to the beetroots in the pot. Turn the heat up for 1 minute or until you see the liquid is bubbling. Turn the heat down very low. Put the lid on and simmer for 15-20 minutes. DO NOT let it dry out. The juice is lovely and you can use it to decorate the dish. (See the main photo). You can also reduce the juice separately if it is too runny. It needs to be a nice consistency for adding a few drops to the dish. Buy your spices from Asian stores. You would probably get them in larger quantities for less cost. This is November now and farmers' markets/or local markets still have beetroot on their stalls. Alternatively, you can buy them at any time from major supermarkets. Phew..... My first food blog.